The Drolet Eco 35 pellet stove was introduced in 2007, a year after the slightly bigger Eco 45. 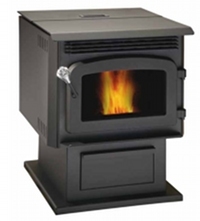 The Drolet Eco 35 is a neat little pedestal type pellet stove producing 35,000 btu/hr, capable of heating up to 1,600 square feet and burning for 27 hours on the low heat setting, ( or 88 hours with the hopper extension). A nice touch is the inclusion of filters for the convection blower to stop dust being blown around the house. (see comments below). Features common to all Drolet pellet stoves are six heat settings, removable door handles, a built in easily accessible ash pan, an optional thermostat and a noise reduction button for the convection blowers. Max. Heat Output 35,000 btu/hr. Min. Heat Output 8,200 btu/hr. zero with optional thermostat. Hopper Capacity 35 lbs. 115 lbs with the optional hopper extension. Convection Blower Capacity 210 cfm. Thermostat Compatible Yes,available as an option. Rear Vent Height 16.7 in. Automatic Shutdown and Re-ignition Yes with optional thermostat. Combustion chamber (welds only), heat exchanger (welds only), auger, and castings. - Parts lifetime, Labor 3yrs. Stainless steel firebox components, surrounds and heat shields, ash drawer, pedestal, trims (aluminium extrusions), and plating (defective manufacture) - Parts 5 yrs. Labor 3 yrs. Carbon steel firebox components, burn pot, glass retainers, and handle assembly Parts 3 yrs. Labor 1 yr.
Blowers, auger motor, PC board, igniter, heat sensors, switches, wiring, rheostat, and other controls - Parts 2 yrs Labor 1 yr. Ceramic glass (thermal breakage only), paint (peeling), gaskets, insulation, ceramic logs, masonry-like panels, and ceramic fibre blankets - Parts 1 yr. It's important to keep the convection blower filters clean to maintain airflow to the heat exchanger. Lots of safety features including a removable door handle and auger housing heat sensors. The control board is pictorial and intuitive. Weekly: Vacuum heat exchanger tubes, convection blower filters and combustion chamber. Clean baffle, glass and ash drawer. Yearly: Clean the venting system, empty and vacuum the hopper. If you would like to leave a review of the Drolet Eco 35 pellet stove, please use the form on the contact page.